My husband has been away at a conference for a few days, and arrived home late last night. I missed him sooooo much while he was gone. The house was orderly and tidy while he was away... everyone was ready for school on time and in bed at night by their bedtimes. The washing was kept up-to-date and all the homework was done right before dinner each night... but there was something missing while Daddy was away - fun (and mess)! Master 10 commented on this fact himself... much to my amusement. You see, I was born to keep things organised and running smoothly... my husband on the other hand was born to have fun, make mess and make progress. He has often mentioned to me that he wishes he was one of The Wiggles (seriously!). Some people may find this hard to believe, as he can come across as quite a serious guy sometimes, but underneath that 'serious and responsible' looking image is a very squiggly guy who loves his kids, animals and being a silly billy!. So now that Daddy is home I am happy, the kids are happy, the Whippet is super happy (for as you know we don't really like each other much), and the house is all messed up again with husband stuff lying everywhere (socks, bags, books, wrappers etc). I really wouldn't have it any other way mind you... it's too boring with just me at home! p.s. and Mr Messy came home bearing gifts... which was super thoughtful of him since I have never (I know - shock horror!) had a Starbucks coffee before. Hope you enjoy your starbucks! I love the photo of him wityh the girls. beautiful. Isnt it lovely how our husbands are different from us. I am impressed that you love the differences, that you don't allow it to niggle and annoy you. 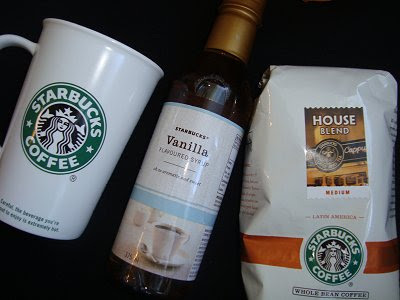 Oh and one more thing... if you like earl grey tea try this... Starbucks vanilla syrup, frothed milk and earl grey tea. I hear it is delicious!!! ahh sound just like my husband, chaos follows in his wake and i pick up the pieces after him, i often dream of things staying in there place for longer than an hour but like you say life would be rather boring if it was that way (although i wouldn't mind finding out if thats true once in awhile?). So sweet! It must be a man thing. My house would be a total wreck if it was up to my husband to get things done. The thing is he thinks he helps. He does cook, but he makes twice the mess that I do when I cook. And, guess who cleans up his mess. He would be terribly missed if he wasn't around making his messes though. my favourite starbucks drink is a venti, trim flat white with sugar free vanilla. It rocks every time. Glad for you he's home! Oh my Lord, you have NEVER had Starbucks before???? Now that you have experienced the bliss that is Starbucks you will note that your life will become brighter, fuller and richer. Them's the facts!! !